This as well! A talented designer could dress a plus-size model's figure the way a composer weaves a symphony. Use larger models. Only accept samples that fit on larger models. That's the tragedy in all of this--that the solution to the problem isn't nearly as complicated as everyone is making it out to be. Use full-figured goddesses instead of starving waifs. 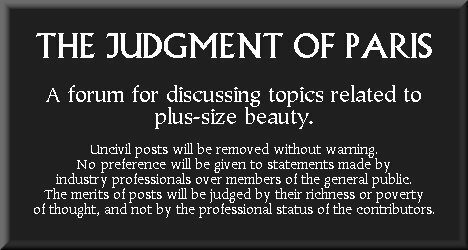 Plus-size models are professional, available, talented, and gorgeous. They can do everything that their malnourished rivals can, only better. Consider one recent development in fashion. Andrea Horblitt's Need, Want, Love site recently announced that the equestrian look is a current trend. Well, just look at how beautiful size-14/16 model Lexi Placourakis (Wilhelmina L.A., Ford Arizona) looks beside her gallant steed. For her part, Lexi looks gorgeous in her white rustic blouse, which is perfectly suited to the theme of the image. Her buxom curves fill out the top in an eye-catching manner, just as her curvy figure is attractively defined by her snug jeans. The tresses falling over her eye is an adorable touch. The image defines the best archetype of the American Heartland--a voluptuous, well-fed filly and her noble stallion. To repeat: there is no excuse for the use of anorexia-inducing emaciated models, when the fleshier girls who populate the industry's plus-size boards can achieve far superior aesthetic effects, making the clothing on offer look much more appealing, and can avoid inducing eating disorders in the process.